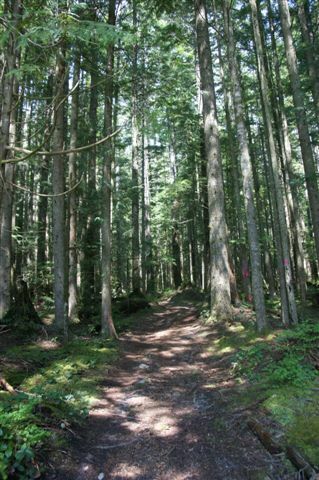 BC Timber Sales (BCTS) is planning on clear-cutting the TrailFest-Wagon Forest (TSL:A87124). 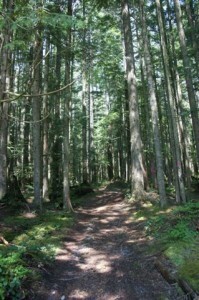 This forest is important as it is a key northern boundary forest in the proposed Mt. Elphinstone Prov. Park expansion area. The section contains many key mountain bike and historic skid road trails, including the popular Caroline’s Connector. 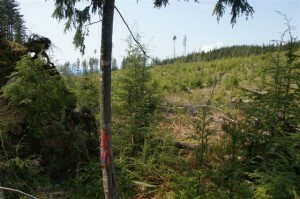 If the logging proceeds it will join up with the massive CNI 160 Ha (400 acre) clear-cut on its northern boundary. We all must contact the Forest Planner in charge and strongly request no more logging of intact forest lands in the park expansion boundaries. 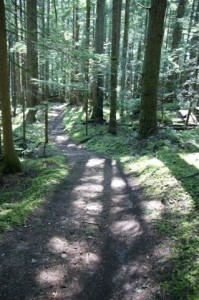 ..
On the mid-slopes of Mt Elphinstone there is a unique forest area zigzagged with many different types of trails. 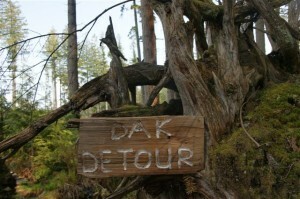 Within that mix, we find historic skid trails constructed before the advent of industrial logging as we know it today. Skid roads were made from logs laid into the ground and used to drag out timber by oxen. These roads have now become greatly enjoyed community trails as they’ve become part of the forest floor. The area experienced selective logging where a few cedar trees were hand cut and skidded downhill to waiting flumes that shot the logs downhill to the booming grounds. Next came the trails that brought hikers into the area as they made their way further uphill heading towards Dakota Ridge and across these slopes. Then mountain biking trails were established, such as Caroline’s Corner and TrailFest-Wagon Trail, which this area is named after. 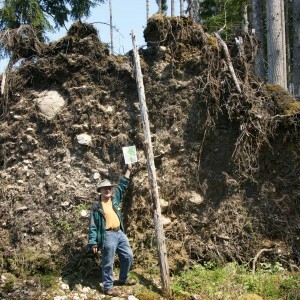 This forest is a BC Timber Sales Cutblock A87124. This is Crown land meaning, that in theory, it belongs to all taxpayers to decide how to manage it, what its future should be and how to benefit from it. Unfortunately, the government puts a zero value on intact, functioning forests that also provide many services, including recreational. Once the trees are logged and sold then the value-proposition game begins. This cutblock will take out another 29Ha of the Mt Elphinstone slopes that has already seen over 50% of the forest lands removed. 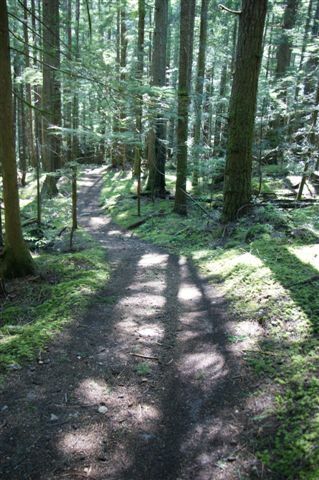 TrailFest-Wagon Forest should not be logged because of the dense trail system in place, and for the very reason that it will end up connecting up with the largest clear-cut on the Sunshine Coast. The northern edge of the proposed block will run 300 meters along the notorious, ‘bad-boy’ of all clear-cuts, the 160Ha CNI clear-cut gong show. Though BCTS plans to leave unlogged an area buffer of several hundred meters between this cutblock and the CNI cutblock, existing blowdowns (one example of a massive tree blowdown shown here) indicate that much of this buffer will fall in the years after logging. In addition, this forest is part of the proposed, expanded Mt Elphinstone Provincial Park under considered by the government right now. All logging within the proposed boundaries should be deferred until the park proposal has been studied by all Ministries, and with public input. 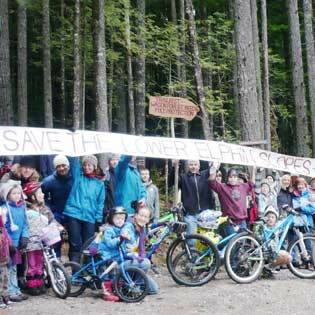 We all must contact the BCTS Forest Planner in charge and strongly request no more logging of intact forest lands in the park expansion boundaries. We’ve made it easy for you to respond. In fact it will just take 3 minutes. Email contacts and message to send is available at the below link.